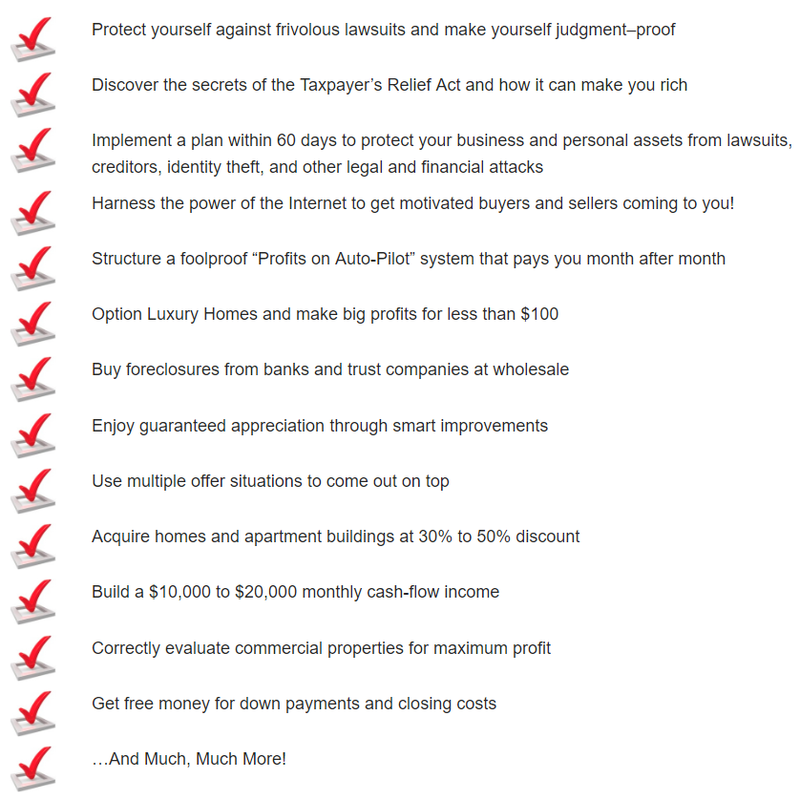 I’ll Reveal The Top Secrets on How To Make Your First $1,000,000 Starting From Scratch! I am inviting you to attend, as my special guest, my Brand New 3-Day Live Intensive Training. These training sessions only happen a few times a year, so don’t miss this rare opportunity. And best of all, you get to attend this event absolutely free as my special guest. And it gets even better—you can also bring your guests for FREE too! Over 21,000 people attended the Real Estate Wealth Expo featuring Robert Kiyosaki, Suze Orman, Rudy Giuliani, and Dr. Albert Lowry. The response for Dr. Lowry’s Auctions and Foreclosure seminar was so enormous that many attendees complained they couldn’t get in to see him. This Will Not Happen To You! So, Mark Your Calendar… Your seats will be guaranteed, but you must register now. Every seat counts and space is limited. PUT A DEAL TOGETHER STARTING FROM SCRATCH!! Learn Step-by-Step how you too can start living your life with FINANCIAL FREEDOM. We start with the basics of property finding. This is a major eye opener!! Most could never imagine so many great methods of finding the best deals. Then I take you into the advanced techniques of property finding that only seasoned professionals know about. You will be using these methods right from the start to buy and hold or sell SUPER BARGAINS. Next, you will learn exactly how much to offer for a property so you know you have a bargain. This makes you a professional. A true bargain hunter!! This special training is designed to HELP YOU PROFIT in good times or bad! I focus on giving YOU the knowledge and the ability to buy property the right way, do quick repairs and then sell them for BIG profits! You will learn this through my detailed instructions. 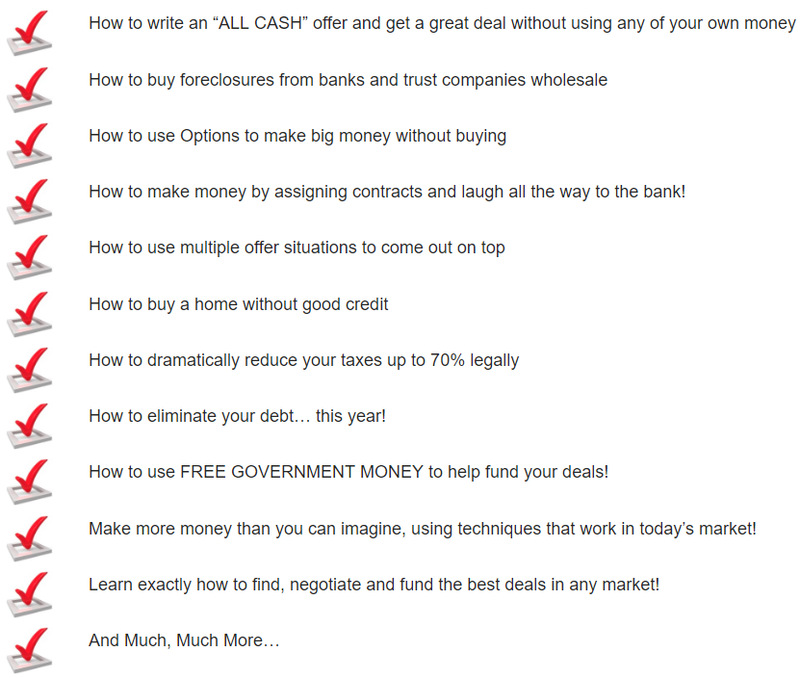 You will learn how to sell a deal using proven methods to get the highest price for your house. This is where knowing how to get the most for the home and how to save on closing costs will add up to thousands of extra dollars to buy cars, vacations, homes and education for you and your family. Remember, once you know how to sell properties correctly the way the pros do, you have a way of making big money that will give you Financial Freedom!!! You’ll learn how to become a real estate “Super Achiever”, establishing an incredible Home-Based Business. You will benefit from the numerous government loans and grants that are available that are just waiting for you to tap into. You will learn how to acquire real estate and personal property for just pennies on the dollar, and with none of your own money! You can retire to a worry–free lifestyle! Bonus 1: Credit Repair Audio CD, which will teach you How to Get, Rebuild, Keep and Improve your Credit. Learn simple things you can do right away to dramatically improve your credit score and remove any unwanted items. Bonus 2: Prize Draw of Cruise Vacations for 2. I am giving away several of these vacation prizes throughout the entire weekend. There is an excellent chance you may be one of the winners! Bonus 3: A Grand Prize Draw Worth $10,000.00! So please come and let me teach you how to become a true Real Estate Entrepreneur. This special event happens only once a year in this area, and it is always sold out. Remember, you must pre-register to reserve your seat in the class. Our regular tuition is $3790.00. However, at this special event, YOU AND YOUR GUESTS CAN ATTEND FOR FREE!!! Remember, you can also bring your guests for absolutely FREE!!! Don’t miss this opportunity of a lifetime to learn how to purchase real estate at wholesale prices! Foreclosures are growing at the highest rate since the Great Depression. Don’t miss out on these Golden Opportunities. Now is the time to make BIG MONEY! P.S. :Each Day we will be holding an Exciting 7-Luxury Cruise Drawing for 2. Be One of the Lucky Winners and enjoy a Fantastic Luxury Vacation! P.P.S. :Seating Is Extremely Limited, So Please Be Sure To Reserve Your Seats Now!